Barclays CEO Bob Diamond has announced his resignation in response to the bank's interest-rate-fixing scandal. NEW YORK (CNNMoney) -- Banking giant Barclays Capital has been rocked this past week by revelations that it manipulated Libor, a key benchmark for interest rates worldwide, for its own benefit. 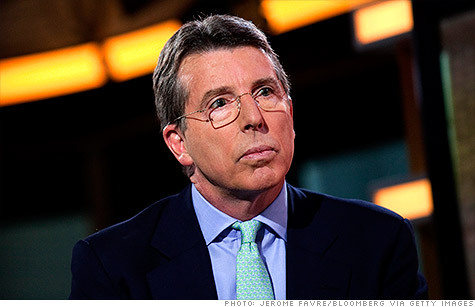 CEO Bob Diamond has resigned, and the scandal appears set to spread to other banks as well. But just what is Libor, and what's this whole controversy about? What is Libor? Libor is short for the London Interbank Offered Rate, a measure of the cost of borrowing between banks and a crucial benchmark for interest rates worldwide. It's actually a collection of rates generated for 10 currencies across 15 different time periods, ranging from one day to one year. Libor rates are set each business day through a process overseen by the British Bankers' Association. Between seven and 18 large banks are asked what interest rate they would have to pay to borrow money for a certain period of time and in a certain currency. The responses are collected by Thomson Reuters, which removes a certain percentage of the highest and lowest figures before calculating the averages and creating the Libor quotes. Interbank rates are measured elsewhere in the world through similar processes. For example, there's also Japan's Tokyo Interbank Offered Rate, or Tibor, and the Belgium-based Euro Interbank Offered Rate, or Euribor. How does it affect consumers? Libor is the world's most important benchmark for interest rates. Roughly $10 trillion in loans -- including credit card rates, car loans, student loans and adjustable-rate mortgages -- as well as some $350 trillion in derivatives are tied to Libor. What's the controversy all about? Last week, U.K.-based investment bank Barclays Capital (BCS) paid $453 million in a settlement with U.S. and U.K. regulators, admitting that it lied in its Libor submissions about its cost of borrowing. The logic is similar to that of an insider trade in the stock market -- if you have advance knowledge of information that will affect a security, you can make trades to profit from it. In addition, between late 2007 and early 2009, Barclays made artificially low Libor submissions. This was during the height of the financial crisis, and the bank was afraid that if its submissions were too high, it would get punished in the markets as investors questioned its health. It's not just Barclays, however -- suspicion has now fallen on all the banks that participate in the Libor process. Deutsche Bank (DB), Royal Bank of Scotland (RBS), Credit Suisse (CS), Citigroup (C, Fortune 500) and JPMorgan Chase (JPM, Fortune 500) are among the institutions that have acknowledged they are being investigated by regulators. UBS (UBS) has revealed that it's providing information to U.S. and Swiss officials on possible Libor manipulation in exchange for leniency and conditional immunity, depending on the jurisdiction. While Barclay's is the first institution ensnared by U.S. regulators, it certainly won't be the last. How big is the scandal? "This dwarfs by orders of magnitude any financial scams in the history of markets," said Andrew Lo, a professor of finance at the Massachusetts Institute of Technology. Given Libor's vast reach and the number of global firms that may be involved in its manipulation, the scandal is prompting calls for resignations, criminal prosecutions, and stricter regulation of the financial sector. Barclays CEO Bob Diamond and chief operating officer Jerry del Missier announced their resignations on Tuesday, following chairman Marcus Agius's announcement a day prior. The bank has been hammered by politicians in the U.K. including Prime Minister David Cameron, who called its actions "a scandal" and "extremely serious." Civil suits have been filed in recent months by a wide variety of plaintiffs -- ranging from mutual funds to individual traders to the city of Baltimore -- claiming they lost profits on Libor-based securities due to banks' artificial suppression of the rate. Defendants in the consolidated case include Bank of America (BAC, Fortune 500), Citi, HSBC, JPMorgan and Credit Suisse. By "surreptitiously bilking investors of their rightful rates of return... Defendants reaped hundreds of millions, if not billions, of dollars in ill-gotten gains," one complaint says. What's being done about it? Diamond is set to testify on Wednesday before British lawmakers investigating the scandal. Meanwhile, similar probes around the world are in progress. In the U.S., the Justice Department is conducting a criminal investigation, and officials in Switzerland and Canada are also looking into the issue. In Japan, regulators temporarily suspended some transactions by UBS and Citi last year after finding that traders at both banks had attempted to influence Libor rates and the related Tokyo Interbank Offered Rate. Regulators themselves, though, are also facing scrutiny. In a lengthy public statement released Tuesday, Barclays claimed it had alerted U.S. and U.K. authorities about suspicious Libor submissions by other banks in late 2008, and was "disappointed that no effective action was taken." The British Bankers Association, meanwhile, says it's reviewing the process by which Libor is set. - CNNMoney's Maureen Farrell contributed reporting.